On the brisk morning of November 13, with the sun peeking through the clouds, Sierra Army Depot, Plumas-Sierra Rural Electric Cooperative, the National Rural Telecommunications Cooperative, ENGIE North America, Berry Construction, and members of the community gathered to celebrate the ribbon-cutting ceremony of the 2.5-megawatt SIAD solar project in Herlong. There was a sense of pride and excitement in the chilly air —from those who were involved with the planning to those who were seeing the project for the first time. Base Commander Lt. Col. Benjamin Johnson and PSREC General Manager Bob Marshall cut the red ribbon as all in attendance celebrated completion of the innovative project. 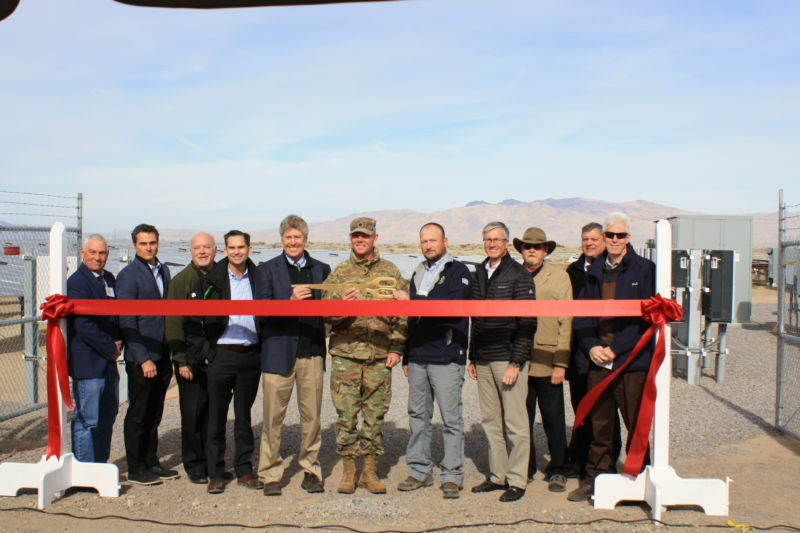 Lt. Col. Johnson spoke about how this project demonstrates SIAD’s commitment to the U.S. Army’s net-zero policy along with the importance of the base’s resiliency. The solar project serves as a mutually beneficial project for both SIAD and PSREC. “This installation has already contributed to PSREC’s system stability and support,” says Bob. NRTC provided support and solutions for the project. 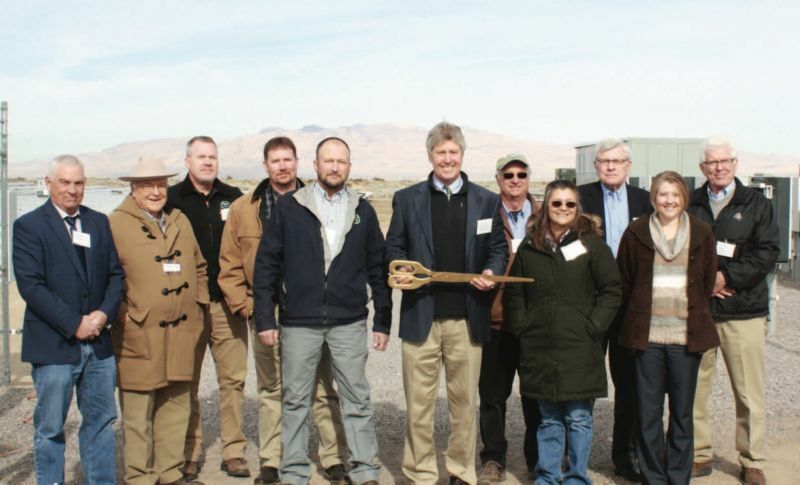 Brad Siebert, NRTC’s vice president for Next-Generation Energy, spoke of how the project is a great example of state-of-the art technology in rural America. He added that storage, which is the next step, is set to follow the same pricing trends as solar. Using refined solar technology, the project will help both SIAD and PSREC “decarbonize, decentralize and digitize;’ says Eric Luesebrink, ENGIE’s senior vice president of development. The ribbon cutting marks the end of years of planning and four months of constrution on the solar array . The array, spanning 10 acres, has an expected output of 2.5 MW — roughly enough electricity to power 400 homes. The project features 10,080 72-cell solar panels with 108 trackers that move panels with the sun to capture as much energy as possible. These trackers each have their own solar panels to power their movements so all the energy produced by the array is available for SIAD and PSREC. The 20 on-site inverters, which are 120 kilovolts each, convert the captured solar power from direct current to alternating current. Although most of the solar energy produced by the project will power SIAD, PSREC has contracted a portion of the output to offer a community solar program to its members. Buying solar power from PSREC’s Community Solar Program is a great option for members who may not want to make the large up- front investment in a solar system, are renting, or live in an area with shading where a solar system would not produce optimal energy output. Community solar is a great way to use renewable power without solar panels on your roof as well as providing members with maintenance free solar energy. PSREC is offering members the choice of a monthly adder to their existing rate or a one-time upfront fee to participate in the Community Solar Program. See the adjacent table for pricing information. PSREC is planning for construction of additional solar energy. For more information about the PSREC Community Solar Program, please call 800-555-2207 or visit our Community Solar page.